Is More Quantitative Easing (QE) On The Way For The U.S.? Two different central bankers from two different continents made news yesterday – both giving us a nod and a wink that at best low rates are here to stay and at worst more stimulus (i.e. quantitative easing) may be coming our way. Peter Praet, the European Central Bank’s chief economist, speaking in Germany, said that falling commodity prices and a slowdown in China are hindering the goal of getting inflation back up to two percent and that if necessary the bank would expand its asset-buying program – the European version of quantitative easing (QE). In July, euro-area inflation was a mere 0.2 percent, unchanged from June. This is better than the negative readings in December through March, but remains suppressed. The ECB targets inflation at just under two percent. Since March this year, the ECB has been buying €60 billion a month worth of bonds. 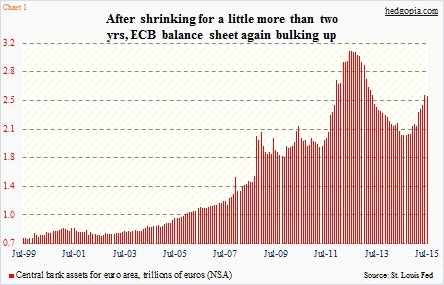 After peaking at €3.1 trillion in June 2012, the ECB’s balance sheet bottomed at €2.04 trillion in September last year, and has since expanded by nearly €500 billion, to €2.5 trillion (see chart 1 above). Inflation nonetheless is a no-show, and has been that way for a while. So why the sudden talk of possibly expanding their bond-buying program? Two weeks ago, China devalued its currency. Previously, the yuan was allowed to move two percent above or below a midpoint set daily by the central bank. Now the band will be based on the currency’s close in the previous trading session. As a result, it is more of a market-determined exchange rate – a managed float. Repercussions are being felt. Vietnam already devalued the dong and Kazakhstan its tenge. The People’s Bank of China’s move came on the heels of an 8.3-percent drop in Chinese exports in July. Enter Germany – Europe’s exports powerhouse. Its economy is already stagnant. 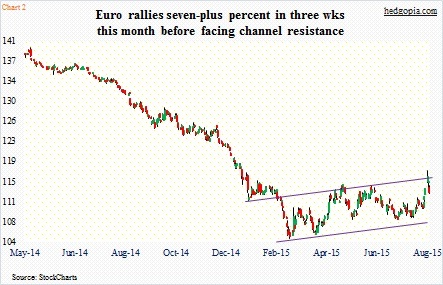 A stronger euro hurts more than helps. In 10 sessions after the yuan devaluation, the euro rallied six-plus percent, before giving back half of the gains (Chart 2). A strong euro also puts downward pressure on inflation. Persistently dropping commodity prices are already not helping the inflation outlook. Hence Mr. Praet’s assertion that the ECB is open to more quantitative easing via bond-buying. 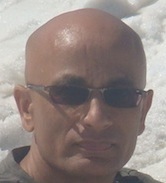 Forget the fact that it has so far not helped where it matters the most – inflation and economic growth. Across the Atlantic here at home, William Dudley, president of the New York Federal Reserve, could not have sounded more dovish. “From my perspective, at this moment, the decision to begin the normalization process at the September FOMC meeting seems less compelling to me than it was a few weeks ago.” He was speaking at the New York Fed. After September, there are only two FOMC meetings left this year, and the one in October does not have a post-meeting press conference scheduled. The window to move rates keeps narrowing. What might have led to the sudden change in Mr. Dudley’s tone? As is the case in the euro zone, consumer inflation is below the Fed’s target of two percent. 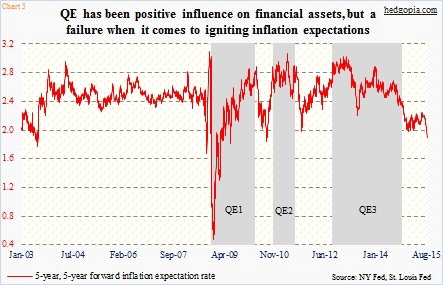 More worryingly perhaps, inflation expectations keep heading south, and, as seen in Chart 3 below, have been this way for a while. 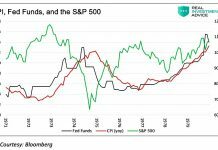 Shortly after QE3 started (the Federal Reserve’s 3rd machination of quantitative easing), the red line in the chart has been making lower highs and lower lows. Hence the question, how long before we start hearing QE chatter in earnest? Stocks are acting very nervous. Volatility has gone up substantially. 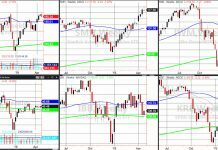 Given how oversold conditions are, we are due for a decent bounce in stocks, and likely in the midst of one – but definitely not out of the woods. Back in the middle of October last year (on the 16th), when the S&P 500 Index was nearly down 10 percent, James Bullard, president of the St. Louis Fed, appeared on Bloomberg TV, saying the Federal Reserve should consider a delay in ending quantitative easing (QE). Stocks bottomed. 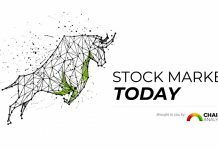 Yesterday, stocks opened strong, initially fell on Mr. Dudley’s comments before attracting bids in the back half of the session. By Tuesday close, from high to low, the S&P 500 was down 12.5 percent. From Larry Summers to Ray Dalio to Jeff Gundlach, several prominent voices have already voiced their concerns as to why a rate hike in September would be a dumb thing to do. 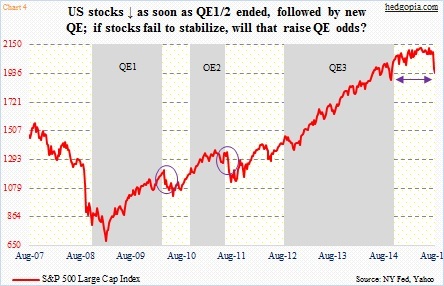 Hence the question – again – how long before we start hearing QE chatter in earnest? As a matter of fact yesterday, Mr. Dudley was asked about prospects for another round of quantitative easing. He replied by saying we were a long way from additional QE. This is no news. Here is the news – QE4 is now in the conversation.